We’ve all experienced the stomach drop that happens when you accidentally delete something. That’s why we’re big fans of backing things up, whether you’re on a PC, a Mac, Android, or iPhone. You can back up your Outlook .pst file like any other file—and you should, even if that means moving it from its default location—but that won’t help you recover an email that you just deleted accidentally. 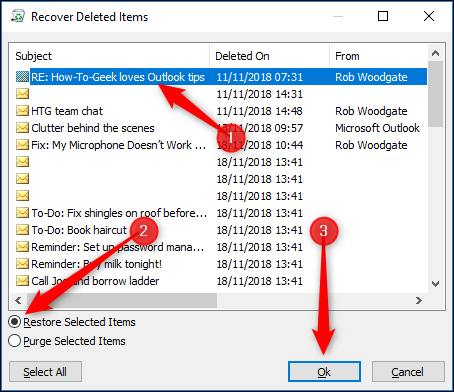 When you “soft delete” an email, by selecting it and either using “Delete” on your keyboard or clicking the “Delete” option in Outlook, the message is sent to the Deleted Items folder. It will generally stay in the Deleted Items folder until you empty the folder (although your company administrators may have changed this to empty your Deleted Items folder automatically on a regular basis). 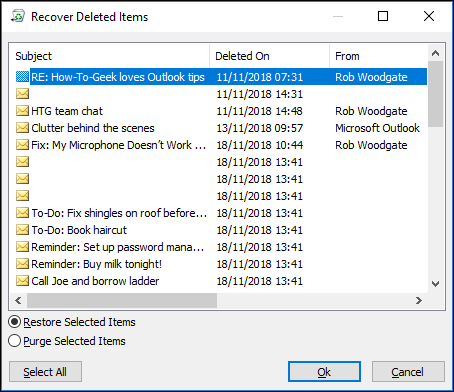 Emptying the Deleted Items folder is known as a “hard delete” because it deletes the message from Outlook on your computer entirely. You can also “hard delete” a message from any folder in Outlook by using SHIFT+Delete on your keyboard, which deletes it without sending it to the Deleted Items folder. If you’ve soft-deleted a message by accident, go to the Deleted Items folder, find the message, and move it back to the folder from which you deleted it. If you’ve hard-deleted a message, you’ll need to use the “Recover Deleted Items” tool. When an email is “hard-deleted,” it is moved to a hidden “Recoverable Items” folder in Exchange. By default, the retention period for these deleted emails is 14 days. This means that for 14 days after you’ve “hard deleted” something from Outlook, it will sit in the “Recoverable Items” folder before being permanently deleted (and being completely unrecoverable). So unless your email administrator has changed the default, you’ve got 14 days to use Outlook’s “Recover Deleted Items” tool to get your accidentally deleted email back. Select the Deleted Items and look at the top of the folder pane for the “Recover items recently removed from this folder” option. Head to Home > Recover Deleted Items from Server. Head to Folder > Recover Deleted Items. All of these options launch the same Recover Deleted Items tool, which displays a list of items in the Recoverable Items folder. The item will be moved back to the Deleted Item folder, where you can then move it back to whichever folder you like. 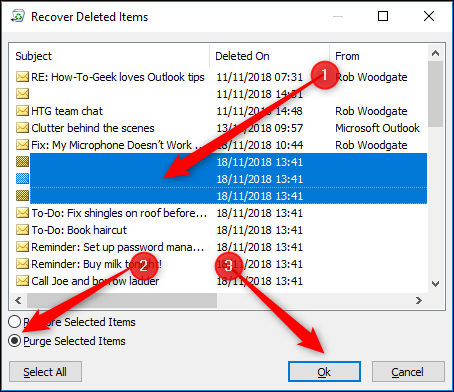 You can recover multiple items from the Recover Deleted Items tool by holding down the Control key while selecting the emails you want to recover. 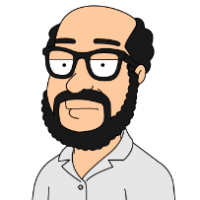 If there’s a whole block of emails, you want to recover, select the first mail, then hold down the Shift key and click the mail at the end of the block to select them all. You’ve also got a “Select All” button if you want to recover all of the emails. If you’ve selected a lot of emails, it can take a little while for them to recover, as they need to be moved from the Recovered Items folder back to your Deleted Items folder. A warning message will be displayed, which you need to take note of, because if you click “OK” the items you’ve selected will be deleted, with no way to recover them. This is a serious warning—purging an item deletes it from Exchange, and it’s gone forever. There’s usually no reason to purge your email, so if you’re in any doubt, don’t use the Purge option. If you’ve deleted something accidentally, and you can’t find it using the Recover Deleted Items tool, do nothing else and call your tech support team immediately. They might have tools that can get your email back, but be warned: they might not. So don’t forget to back up regularly!